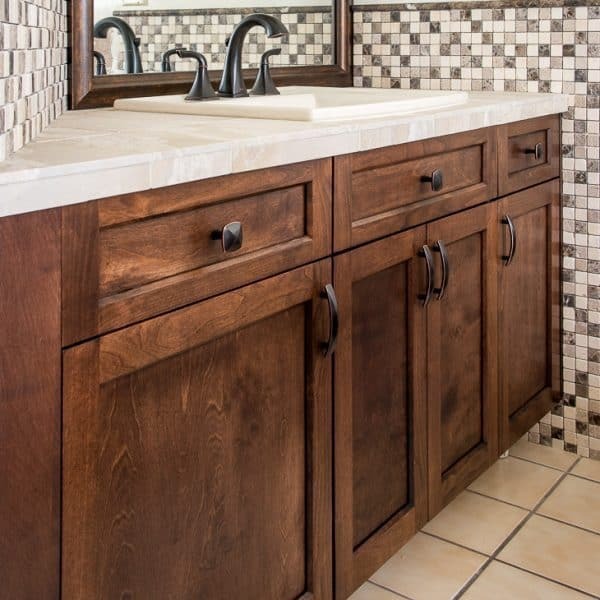 You don’t need to tear out your entire bathroom vanity to get the look you want. Just install new cabinet doors! 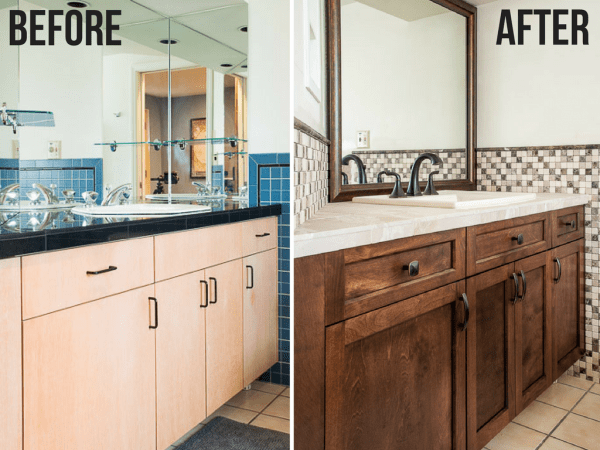 This simple bathroom update makes a huge difference for a fraction of the price of new cabinetry. Welcome back to Week Four of the One Room Challenge! You can see all the progress I’ve made on my bathroom remodel here. This week, the vanity area is almost complete! 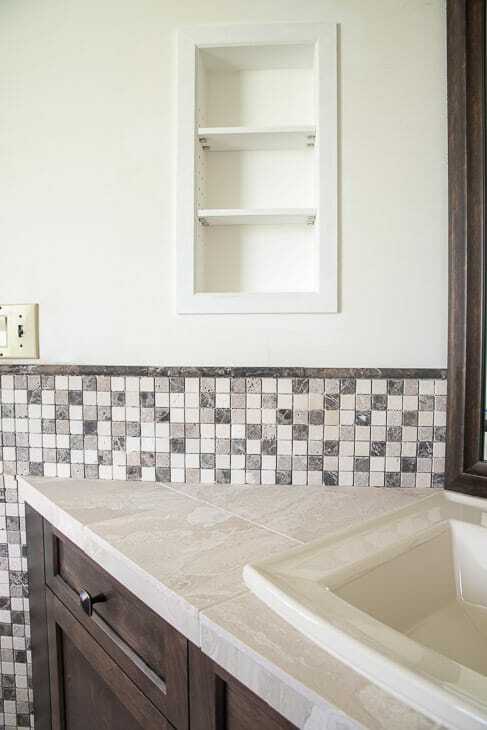 I installed new cabinet doors and tiled the backsplash with a gorgeous stone mosaic that pairs perfectly with the limestone tile I used on the countertop. It’s all starting to come together! This post was sponsored by Cabinet Door Mart, Jeffrey Court, and Liberty Hardware, and contains affiliate links for your convenience. Purchases made through these links may earn me a small commission at no additional cost to you. Our bathroom vanity was custom built to fit into this angled alcove. The cabinetry itself is pretty solid, but the doors were dated and bland. Time for an update! After taking careful measurements of each door and drawer front, I headed to the Cabinet Door Mart website. 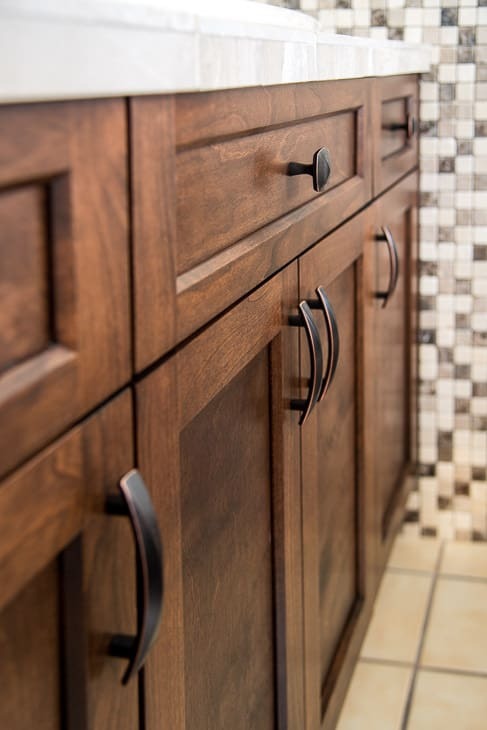 They’ll customize your new cabinet doors to fit your existing vanity perfectly! I wanted the same Artesia door style as the pantry cabinet I built for our kitchen, but this time I chose the solid wood version with a birch panel and alder frame. The back of the bathroom’s sliding barn door is birch plywood, and I wanted the grain patterns to match. 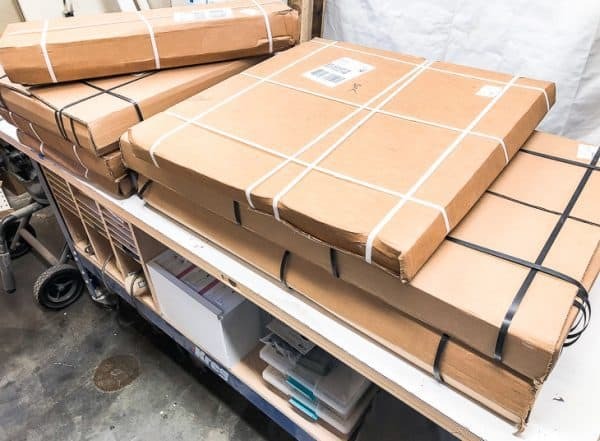 All my new cabinet doors arrived carefully packaged and ready for the finishing touches. 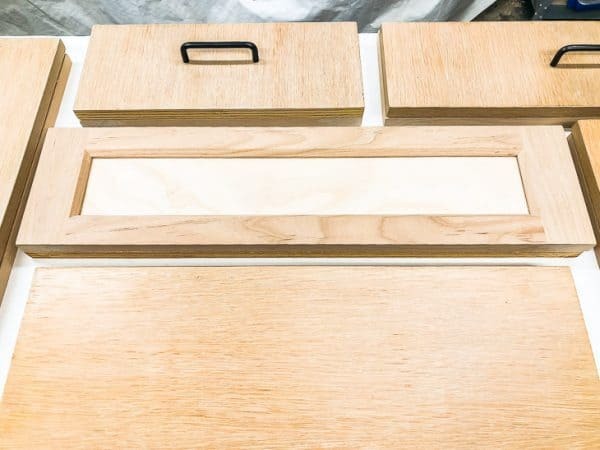 You can order your new cabinet doors with the hinge holes pre-bored into the back. But the old door hinges weren’t located at the same spot at the top and the bottom, so I decided to drill them myself. Match up the old and the new cabinet doors to check the size and to keep them from getting mixed up. Selecting the hinge hole depth was easier this time, because I could work off of the old doors. I simply inserted the concealed hinge jig into the hole of the old door, and adjusted the dials until it was snug against the edge. Then I measured the distance between the jig and the edge of the door, and marked the same spot on the replacement door. This tool makes it easy to lock down the dimension and transfer it to the new cabinet doors. Clamp the concealed hinge jig down, then drill the hole. 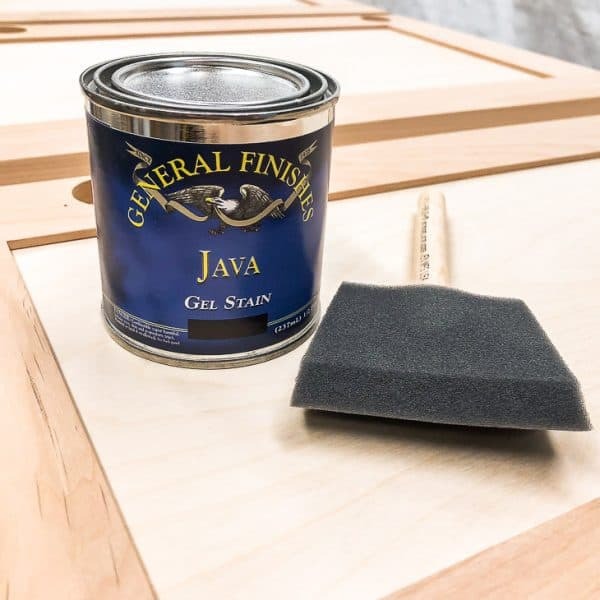 I’m a total sucker for General Finishes’ gel stain, ever since I used their grey wood stain on my dining table with amazing results! This time, I decided to try their Java color, which matches the sliding barn door I made for this bathroom. 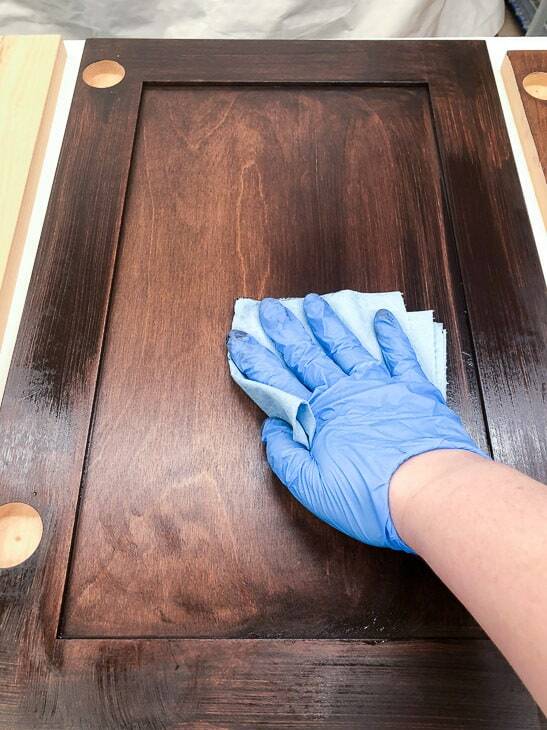 Just apply the gel stain to your new cabinet doors with a foam brush, then wipe off the excess with a rag or shop towel. Easy peasy! Gel stain is oil-based, so let it dry for a few days before applying a top coat. I used General Finishes High Performance Top Coat. It holds up well to moisture, which is important in a bathroom! 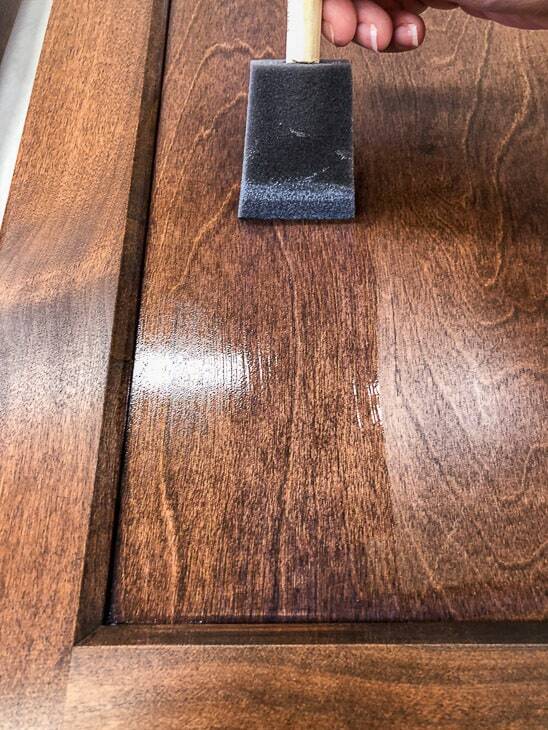 Allow the top coat to cure for as long as possible before installing the new cabinet doors. I’m under a tight deadline, so I only waited a couple days and handled them very carefully. While everything is drying, it’s time to shop for new door hardware! Liberty Hardware was kind enough to provide me with their gorgeous Devereux door pulls and knobs for this project. The bronze finish with subtle copper highlights matches the faucet I installed last week, and looks great against the wood. I used this template to mark where to drill the holes for the pulls. The knobs were centered on the drawer fronts. I had to buy shorter screws for these, since the center panel is thinner than the outside frame. Installing the new cabinet doors was pretty simple, since I used the same hinge placement as the old doors. I left the hinges screwed into the interior of the cabinet when I did demolition on the rest of the bathroom. All I had to do was pop the hinge cup into the hole in the door and screw it in place! There should already be holes through the drawers from the old drawer fronts. 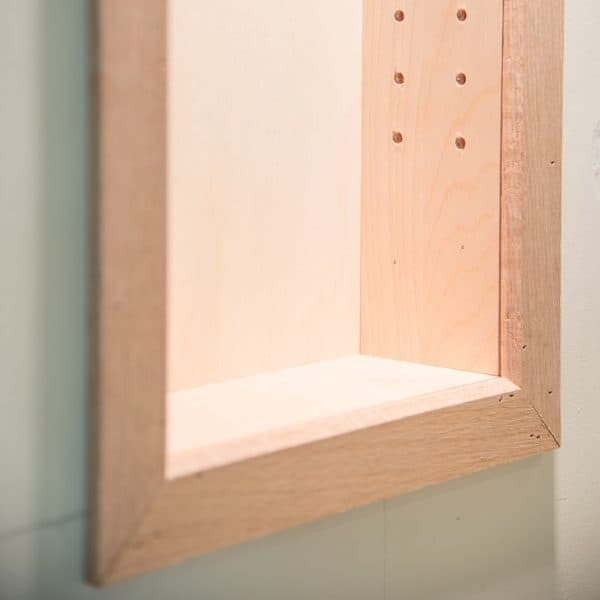 Just mark those holes on the back of your new drawer front and drill a shallow pilot hole. Then screw the new drawer front in place. What an amazing transformation! Even without the new tile, this would have been a major update to our bathroom. 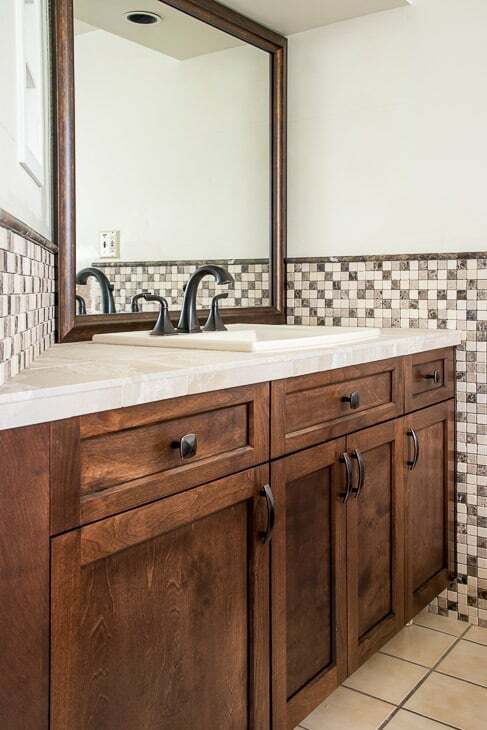 I love how the dark doors really make the limestone tile pop, and they coordinate with the mirror frame perfectly! Now I need to tackle the other side of the bathroom! The tub deck will be tiled next, followed by the rest of the wall tile. But first, I need a nap! Things are moving right along in Week Four of the One Room Challenge! Not only did I install the new cabinet doors, but I finally started to put up my gorgeous mosaic tile from Jeffrey Court! I gave a little hint about my tile selection last week when I installed the limestone tile countertop. 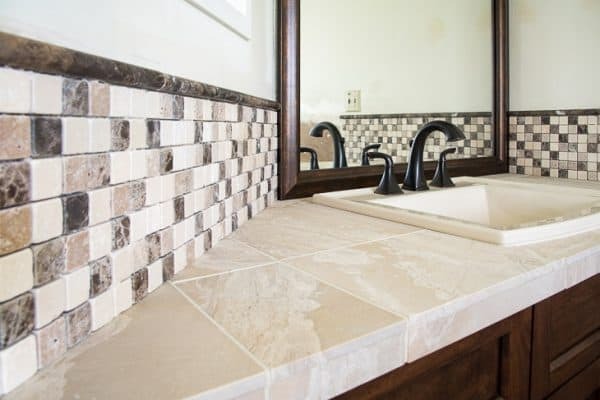 The vanity backsplash and wall tile will all have this beautiful Emperador Mix Mosaic that brings together all the colors of my bathroom makeover. The coordinating dome trim caps off the edges and brings definition to the tiled spaces. I loooooove how it turned out! I’m waiting until all the wall tile is installed before I grout, so I can do it all in one day. Hopefully I can get that finished this week, because time is running out! If you would like to keep up to date with my latest posts about DIY projects, home improvement and more, you can follow me on Facebook, Pinterest, or Instagram. 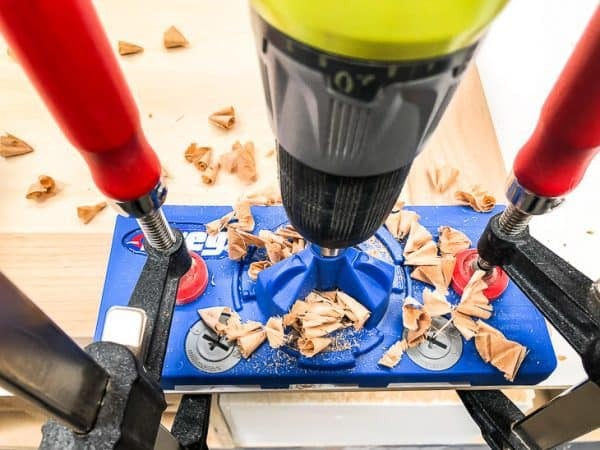 You can also sign up for my email list below and get the latest post delivered to your inbox, plus exclusive access to my woodworking plans library! Wow! The cabinets looks great! Wow, lady! You are a serious handy lady! These cabinets look amazing! The cabinets along with the stain came out so pretty! Such a huge difference from the previous cabinets. Good luck with Week 5’s progress! Wow – those new doors are great! Not sure if i’d be brave enough to drill my own hinge holes though – i’d be SO scared I’d screw it up! Love your new cabinet doors. The stain is gorgeous. I need to try that gel stain! Oh my gosh I love it, now I’m wishing I’d re-stained our master bath vanity instead of painting it. Hey, maybe I’ll just order new door and drawer fronts and stain that dark and leave the base painted 🙂 Yours turned out so beautiful, what a great change that easy update made. And taking out the other wonky angled mirrors really elevated the entire vanity area from funhouse to fabulous! Wow Vineta!!! That looks AAAmazing!!! 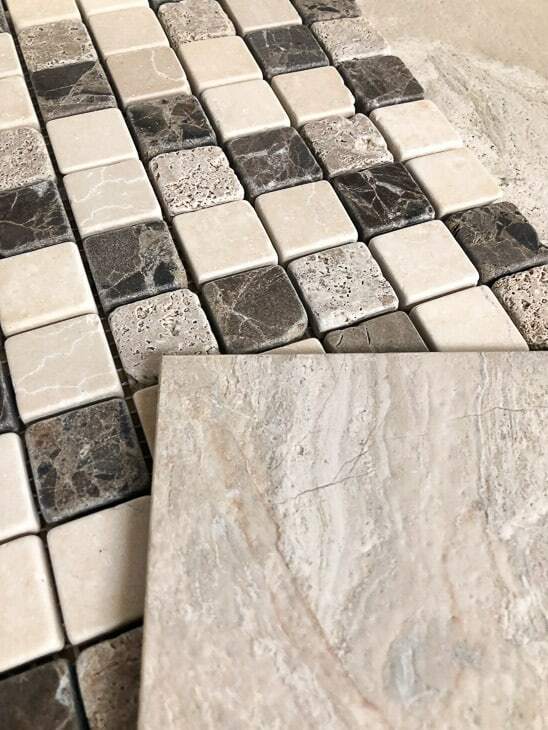 Your tile is gorgeous…and you’re afraid you won’t get done in time, you got this girl!!! What a simple way to add depth to you cabinets! We are working on our bathroom right now too. It’s so fun to see how others are tackling their space. Can’t wait to check back in next week. This looks totally custom! Great job Vineta!!! This turned out great. I have a bathroom redo in progress. It’s taking us forever to finish. But, I might have to try this hack. If we don’t have to replace the counter top. I know sponsors to the ORC because they want the exposure. 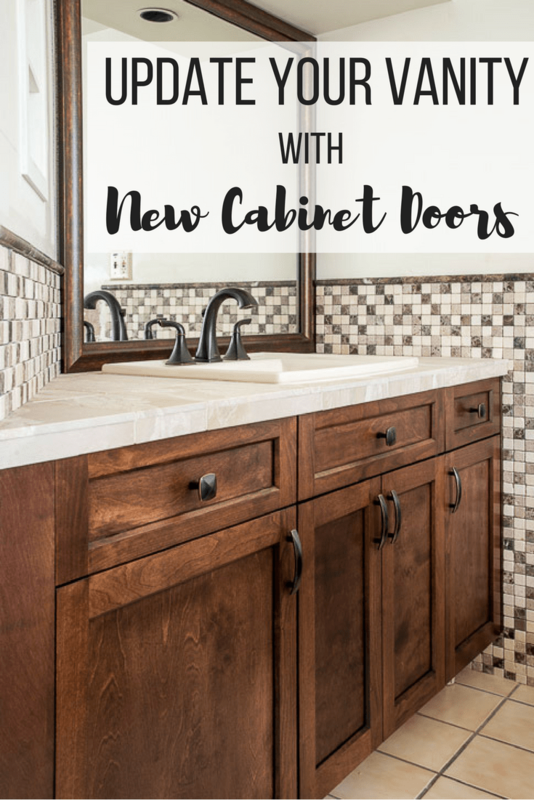 Well I’m here to tell you, Cabinet Door Mart, that I had never heard of you until this post, and this is an AWESOME option to avoid replacing the entire vanity!! I am impressed that you drilled the holes yourself! 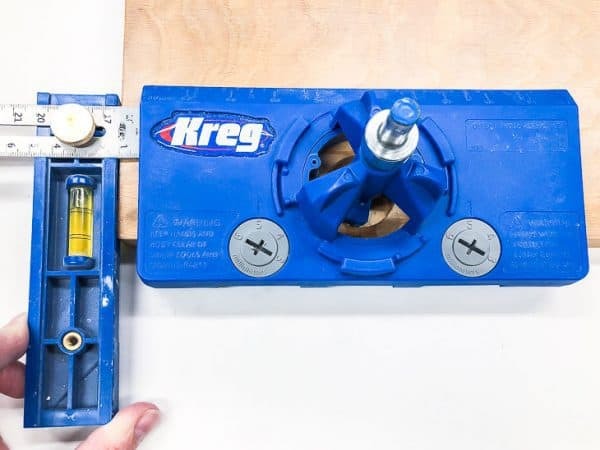 I have Kreg mini that I find indimidating and admire how you drilled the holes just right. BEAUTIFUL finish on the doors, just gorgeous! I LOVE your cabinets! Did you also strip the wood down on the original shell and stain it too? Did you replace the drawer fronts as well? Great idea to replace the doors. If so, how was it hard to remove the old drawer fronts? You really did a great job! Thanks Karen! 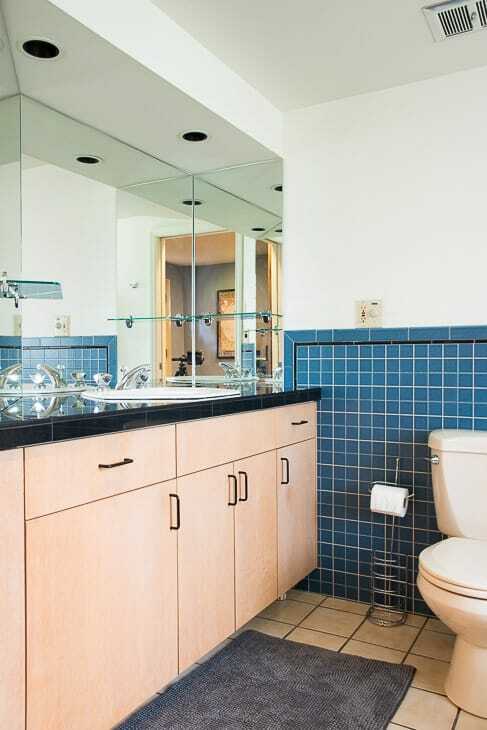 There were only two small sections on either side of the vanity that were visible with the doors closed. When I tried to remove them so I could tile behind them, they split. I cut duplicates out of plywood and stained them the same color as the doors. If you’re staining the frame of the vanity in place, you can just give them a good sanding and stain them that way. I replaced the drawer fronts as well. They were super easy to remove! There should be a screw on the inside of the drawer holding them in place. The false front in the center was screwed on from the inside as well. You are so handy lol. I really love the stain you used and the tiles on the wall. Thanks for sharing at Party in Your PJs. My wife and I have been planning on updating our bathroom in a remodel. The vanity cabinets look outdated also and we want to fix it up. And how your cabinets ended up looking, wow, they look great stained. Nice. i want to do something similar even at my townhouse, but i was discouraged because everything instructional has all of these ways to measure cabinet openings and boxes. 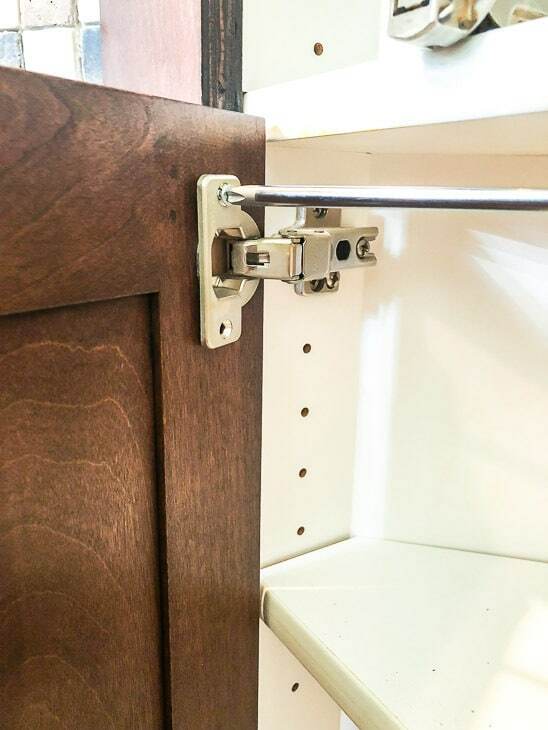 I am like, “why can’t i just use the door measurements from the doors already on my cabinet?” no one just says, simply measure the current doors and use those measurements for your replacement doors. What did you do with the cabinet frame, because i assume if the doors were laminate then so was the rest of the cabinet? Replacing the cabinet doors is soooo much easier! I left the cabinet frame as is, so it’s still white laminate inside. You can’t really see between the gaps in the doors unless you’re looking at it from the floor (or the tub). Excellent makeover! Love the Shaker style doors. The finish you have applied is the icing on the cake. Looking forward to the next project. Happy Holidays!